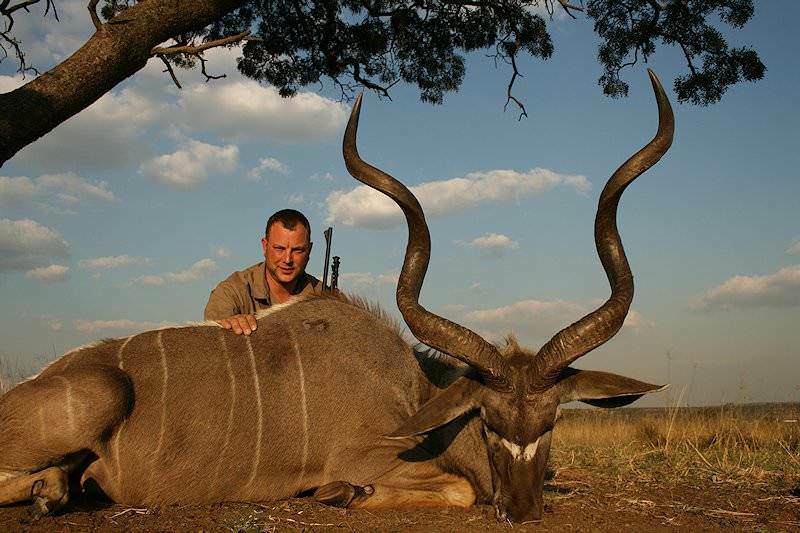 The kudu is the grandest of the spiral-horned antelope that can be hunted in South Africa. 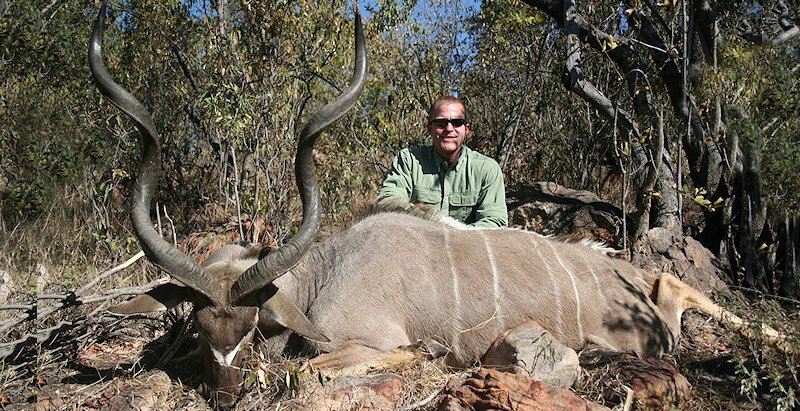 Hunting kudu remains on the top of the list for just about every hunter who comes to Africa. 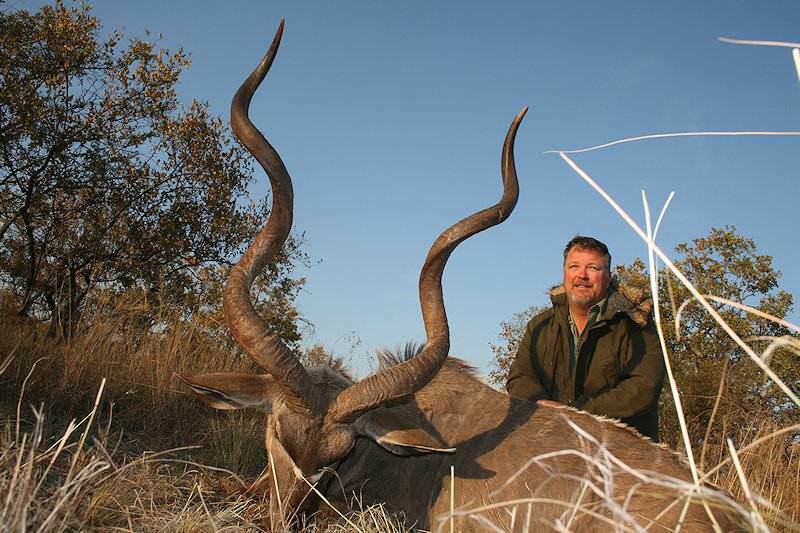 He is probably second only to the impala as Africa's most sought-after plains game trophy. The kudu is a big antelope with a stately bearing. 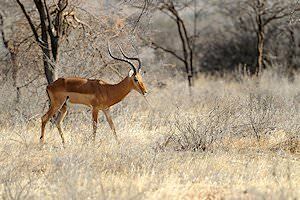 He is strikingly beautiful, with long spiral horns that set him apart from all other of the antelope species. The 'grey ghost', as he has been nicknamed, sports a coat of pale-grey to brownish-grey with white vertical stripes down the flank. He has a distinctive white chevron marking between his eyes, which set off the very long spiral horns carried only by the bulls. 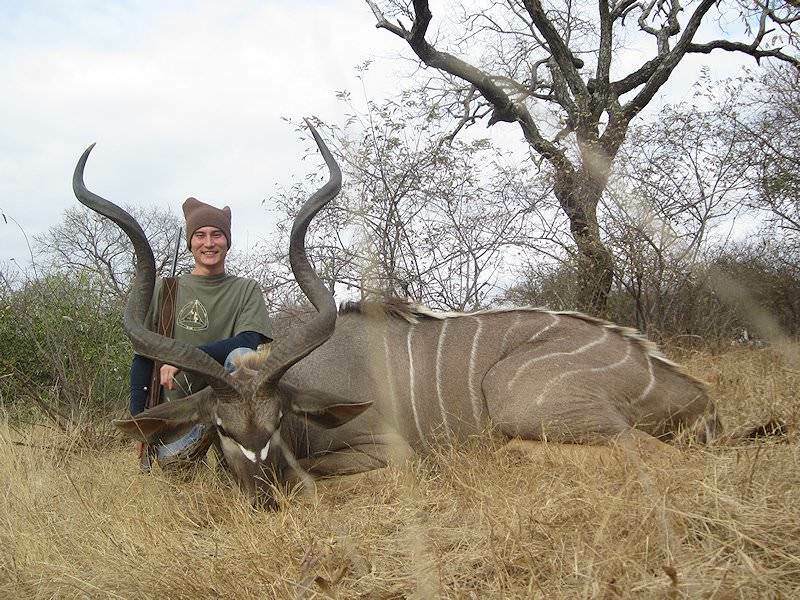 Kudu cows look very similar to the males and, while they lack horns, their ears are quite prominent and beautiful. Both sexes display white beneath the tail and have a conspicuous hump on the shoulder. 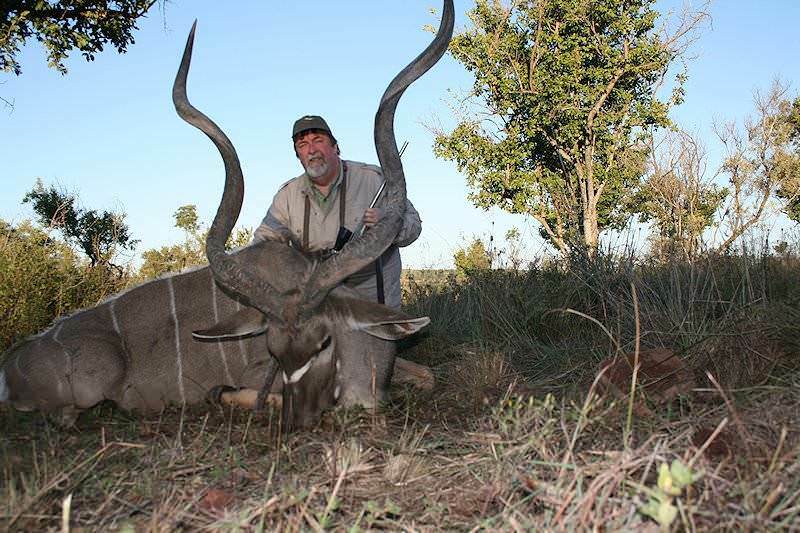 Hunting kudu is best accomplished in the bushveld, where leaves, fresh sprouts, seedpods, and fresh grass are abundant. The kudu tends to browse in the early morning and late afternoon, usually resting during the heat of the day. Like many of the antelope species, this majestic giant tends to form family groups of 6 to 12 individuals; mostly cows and calves, with the bulls only joining the herd during mating season. The bulls form bachelor herds or become solitary. This is a graceful animal in flight and extremely athletic; he can jump remarkably high for his size. In spite of those long horns, the bulls can travel at great speeds through the bush by laying their horns low along their backs. 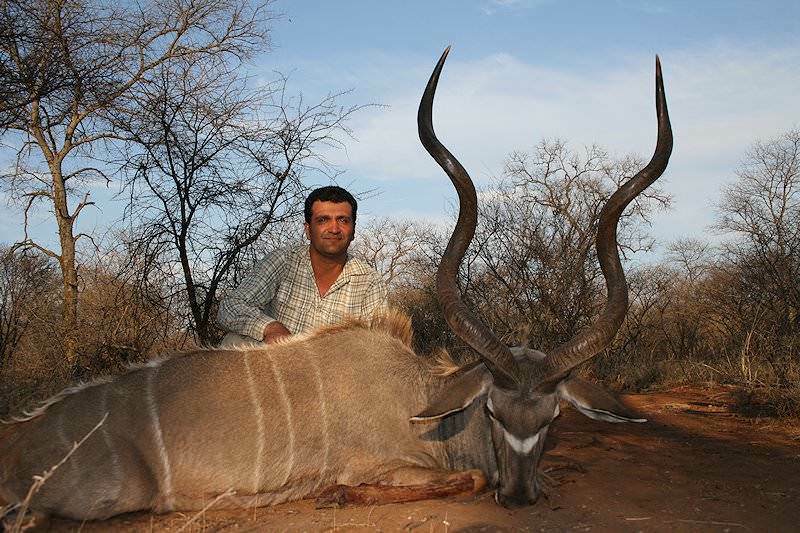 Hunting kudu can be extremely challenging, as the 'ghost' is very sly and extremely elusive with exceptional senses. Look for spoor around pans and water holes as he drinks regularly and will never be far from water. 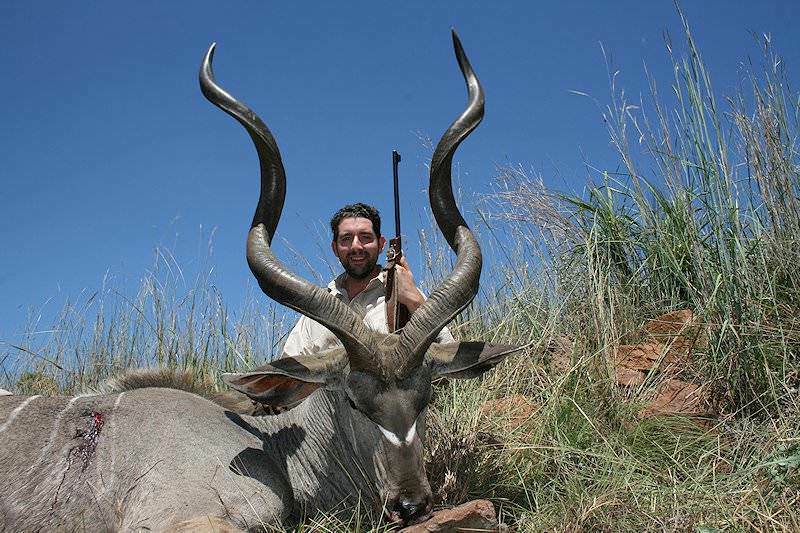 Because the depth of the curl of individual bulls' horns can vary so much, trophy assessment can be difficult. Horn lengths in the low 50's are fairly common; 55 inches and over can be considered a really good trophy; and 60 inches and over is exceptional. 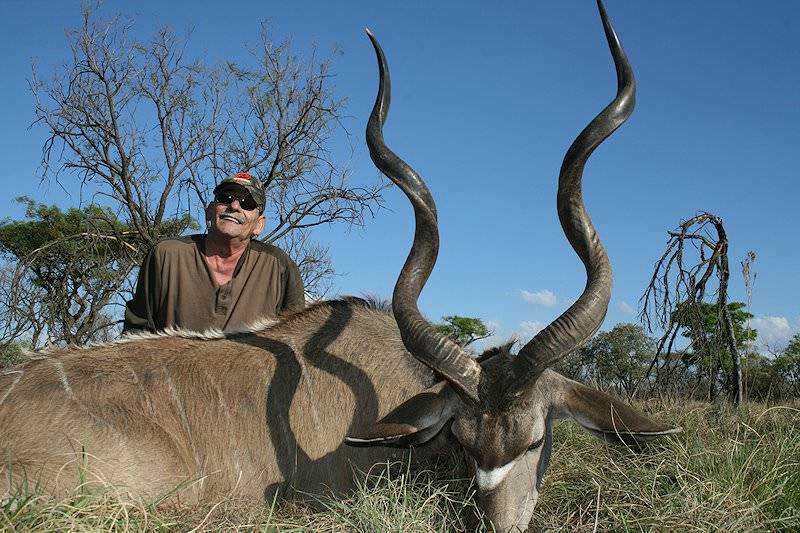 Several methods can prove productive when hunting kudu. Check likely feeding areas in the early morning hours, and stalk. Ambush likely feeding areas at daybreak as the bulls return to higher ground and cover. 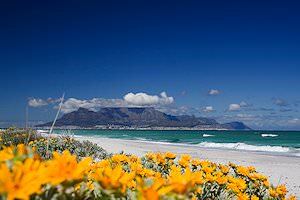 At midday, you can lie in wait by approaches to water, as they are regular drinkers. 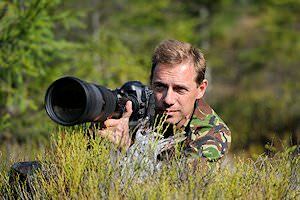 In addition to these techniques, consider tracking if the ground permits, or try still-hunting in thick cover. While your favorite deer rifle may be adequate, good quality controlled-expansion bullets are essential. 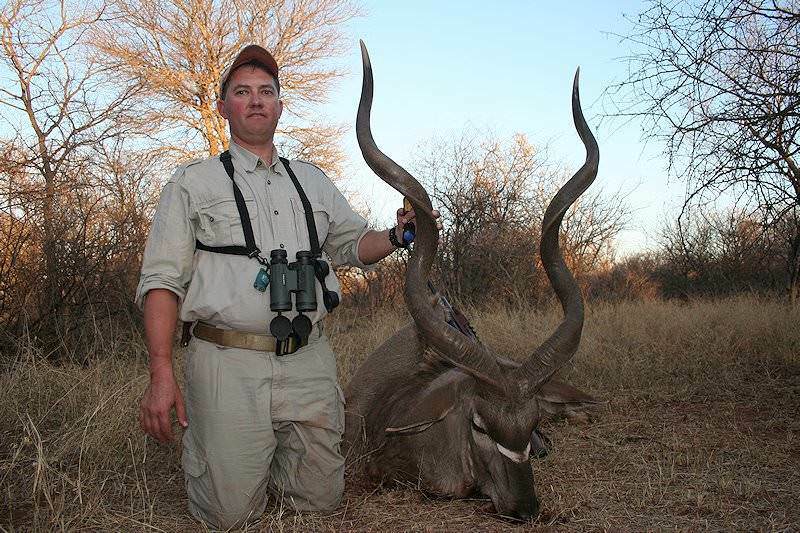 Hunting kudu with less than 7mm or .270 caliber rifles would not be recommended. Not especially tough, the larger calibers are not considered necessary, however, with tongue in cheek I remind you that "you can often be under-gunned, but for all intents and purposes, there is no such thing as having too much gun”. 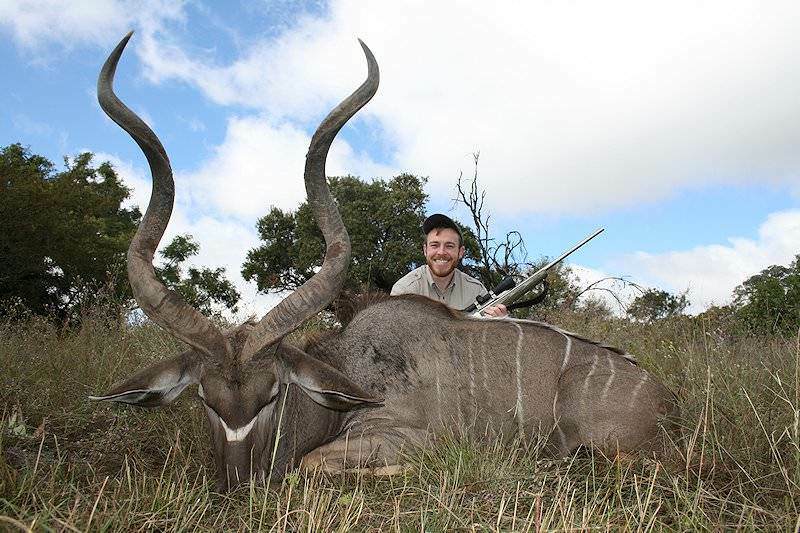 As with all species, when hunting kudu, shot placement is paramount. The neck or head shot can ruin a trophy so rule it out! The high heart/lung shot is the ticket here. 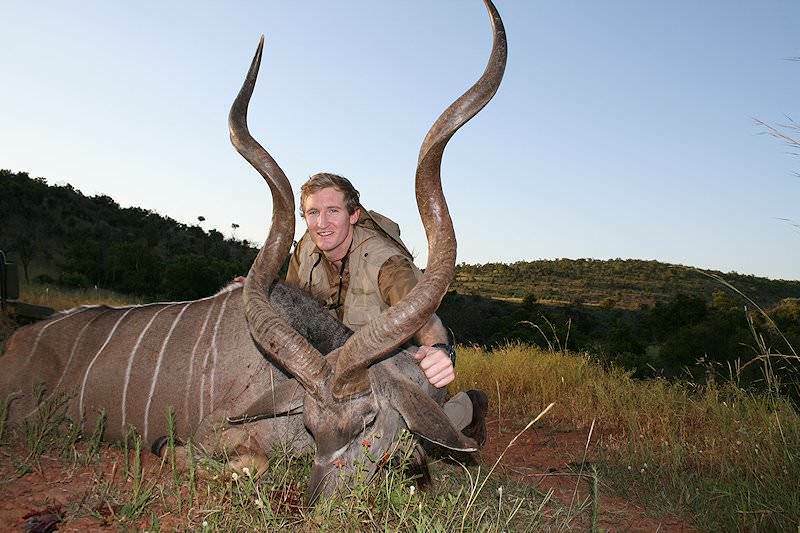 Bring your sights directly up the foreleg about one third into the body and squeeze; this shot effectively takes out the plumbing from the heart and your kudu will not go far. 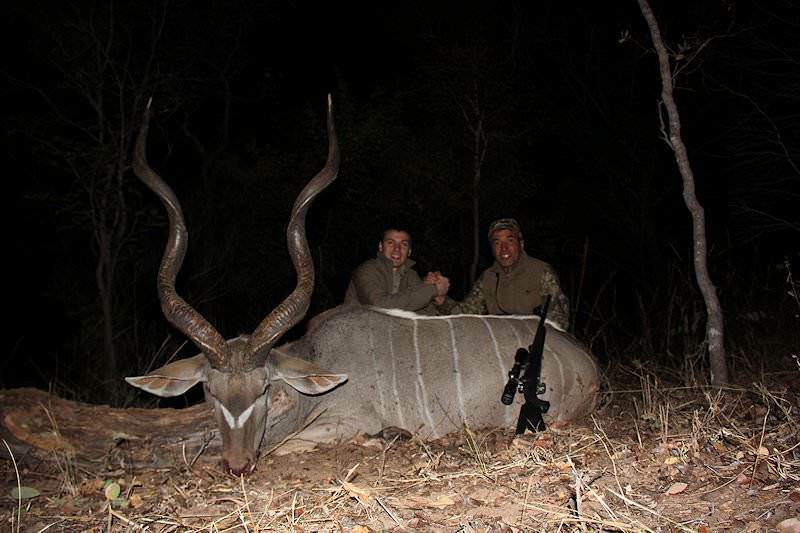 A little higher will take lungs, and you may have a bit of tracking to do but your kudu will eventually go down. If your shot is placed much higher, i.e. above the half way into the body mark, you will probably be in for a long day and may even risk losing the beast. For the biltong hunter, place your shot just behind the shoulder, which will effectively take the lungs. 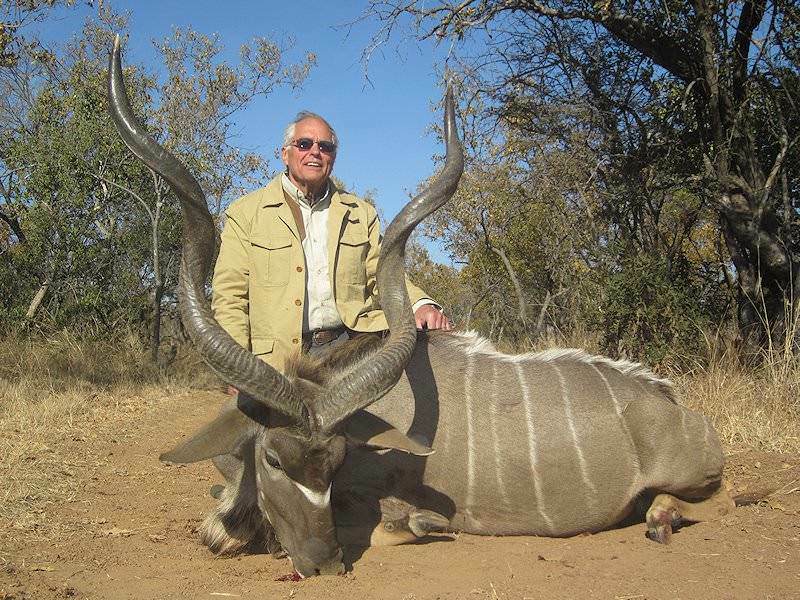 Hunting kudu can be most exciting and rewarding; while those 50 to 60 inch bulls can be extremely elusive, keep in mind a good representative 45 to 48 inch set of spiral horns with nice ivory tips still looks very good on the wall! 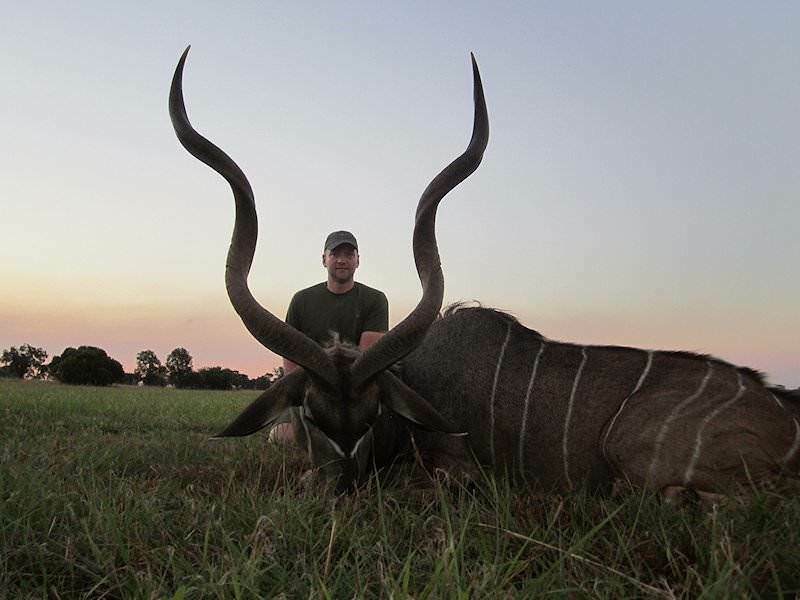 Hunt in one of South Africa's most iconic wilderness areas - the bushveld region - for kudu, Burchell's (common) zebra, blue wildebeest, impala and warthog. The package is all-inclusive, with the option to take more trophy animals if the opportunity presents itself. 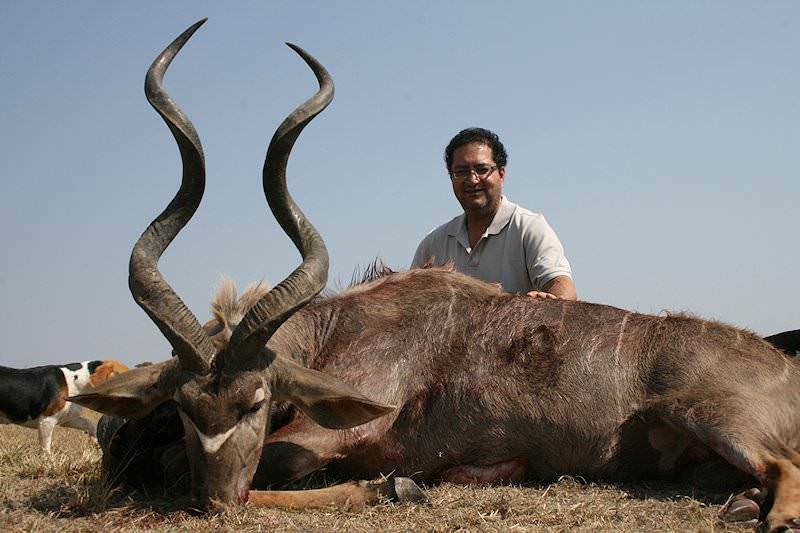 A hunting package for serious plains game trophy hunters looking to add something unique and region-specific to their trophy collection. 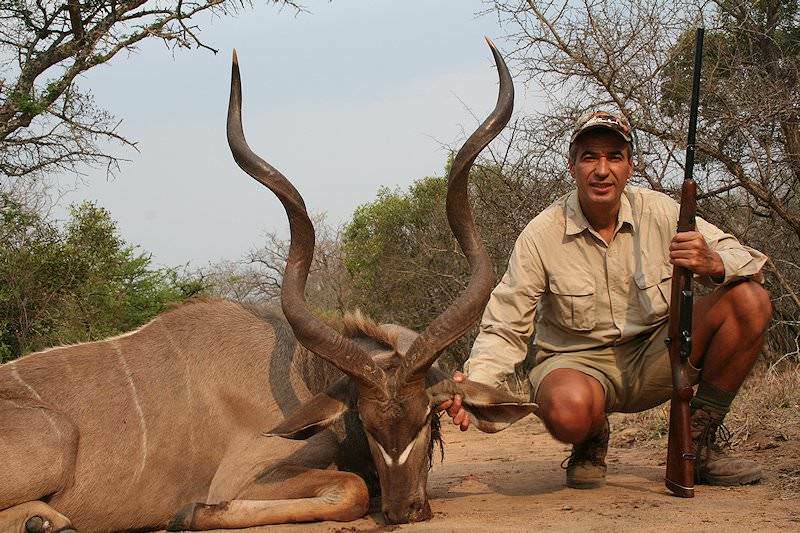 Hunt in the Eastern Cape province for Cape kudu, caracal and the elusive mountain reedbuck. 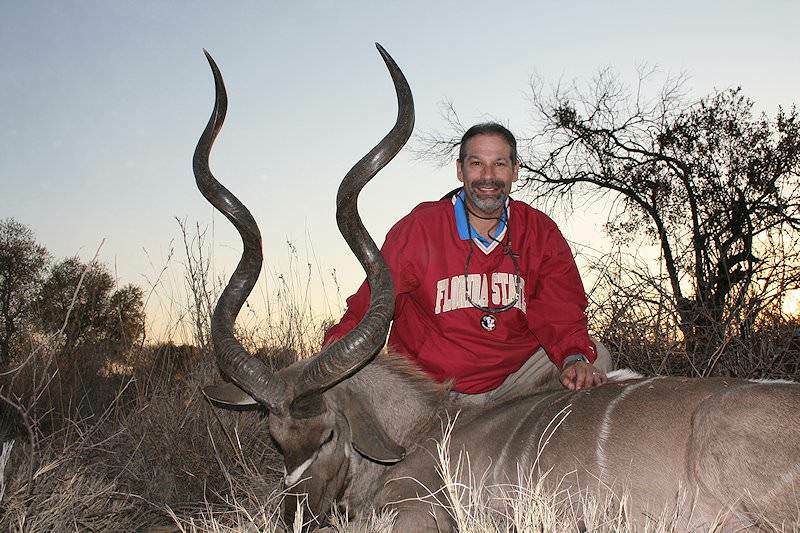 The ideal father-and-son African hunting adventure. 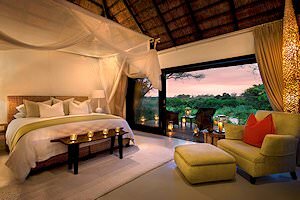 With this package, the five trophies are shared between the father and son and include a kudu, impala, blue wildebeest, zebra and gemsbok. The hunt is conducted in the bushveld and eastern Free State. 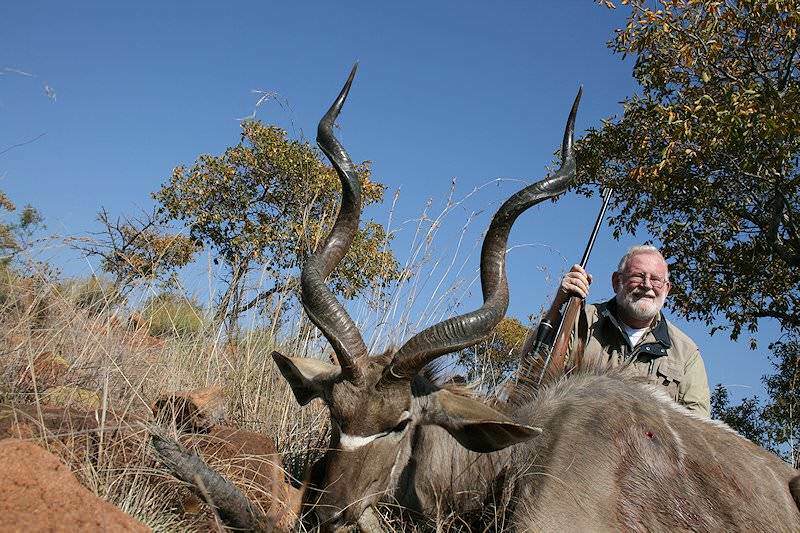 A two-week hunting expedition split between South Africa's two most fruitful hunting areas - the wooded savanna of the bushveld and the wide, open plains of the eastern Free State. 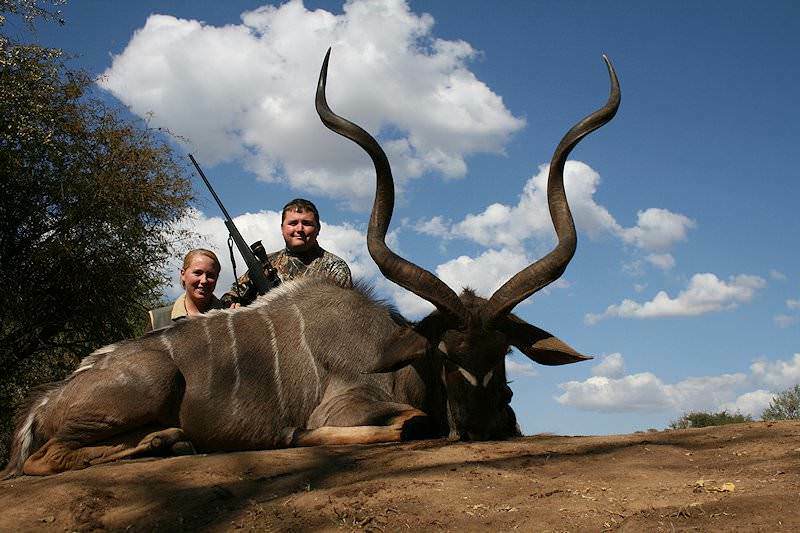 Seven trophies are included, from kudu and impala to black wildebeest and springbok. A hunting adventure to remember for a lifetime - three weeks, three distinct hunting regions and twelve remarkable plains game trophies. 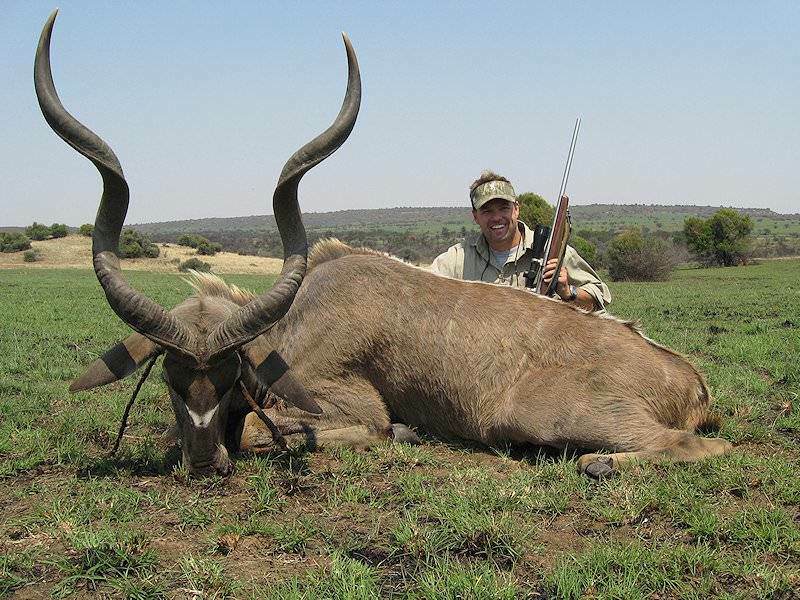 The hunting areas are the bushveld, Free State and Eastern Cape, while the trophy bag includes popular animals like kudu and gemsbok.